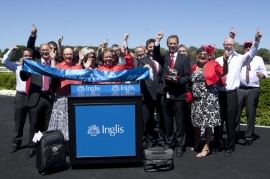 $500,000 in Inglis Race Series prizemoney is up for grabs in less than four weeks with the $250,000 Inglis Classic and $250,000 Inglis Premier races to be conducted on Saturday 7 February 2015. Both races carry black type Restricted Listed status. The $250,000 Inglis Classic will be run over 1200m at Rosehill in Sydney and is restricted to two-year-olds entered into the Inglis Race Series that went through last year’s Classic Yearling Sale Summer Book or Winter Book. Nominations close 11:00am Monday 2 February. Gerald Ryan and Triple Crown Syndications used the 2014 Inglis Classic race to launch Peggy Jean into the autumn. The $46,000 yearling buy went on to claim the Group 1 ATC Sires’ Produce Stakes during The Championships only a few months after her Inglis Classic race triumph. The $250,000 Inglis Premier race will be run over 1000m at Sandown Hill in Melbourne and is restricted to two-year-olds nominated into the Inglis Race Series that were offered at the 2014 Inglis Premier Yearling Sale in Melbourne. Entries close 12:00pm on Monday 2 February. Hawkes Racing’s galloper Gold Force won last year’s Inglis Premier, while the two previous winners were subsequent Group winning juveniles Twilight Royale and Snitzerland. In addition to the race prizemoney on offer, the winning trainer of both the Inglis Classic and Inglis Premier aces will receive a set of Swarovski Optik EL 42 Swarovision binoculars valued at $3,000. The winning jockeys and the managing owners will also receive an exclusive piece of Antler Luggage valued at $544. Inglis Race Series events provide owners and trainers with not only tremendous financial rewards and trophies but a proven launching pad to Group 1 glory as evidenced through the subsequent deeds of Inglis Race Series event winners Mossfun, Peggy Jean, Snitzerland, Starspangledbanner and Cosmic Endeavour. All yearlings offered during the 2015 Inglis Select Yearling Sales Series are eligible for nomination into the $5 million Inglis Races Series.